If federal lawmakers defund Planned Parenthood, Republican Massachusetts Gov. Charlie Baker is pledging to fund the organization. The Massachusetts House overwhelmingly approved $8 million Wednesday to offset the potential loss of federal funding to women's reproductive health organizations under a new Trump administration rule. Twenty Republicans joined the vast majority of House Democrats in voting 140-14 to send the bill to the Senate, where approval is likely on Thursday. Republican Gov. 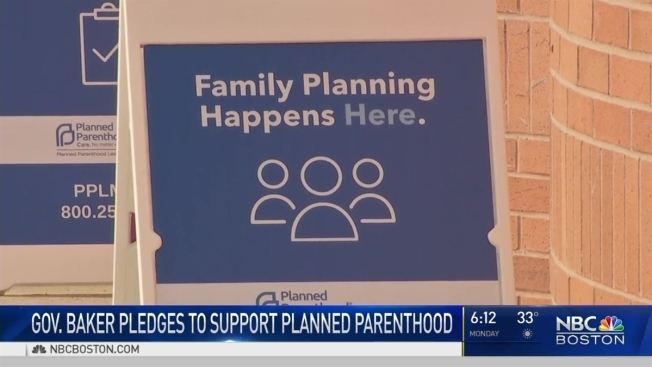 Charlie Baker has also voiced his support for providing state money to close any gap in funding in the family planning program known as Title X. The final rule released last month by the U.S. Health and Human Services Department would prohibit federally funded family planning clinics from making abortion referrals and from being housed in the same offices as abortion providers. A number of U.S. states have sued to stop what critics have derided as a "gag rule" from taking effect in May. Planned Parenthood and the American Medical Association have also mounted a legal challenge. Democratic Speaker Robert DeLeo said Wednesday he was proud the House voted "to counter the Trump administration's dishonorable actions." No House members spoke against the measure before the vote. "We applaud Massachusetts' leadership, but we must be clear: states should not have to protect their residents from their own federal government," said Dr. Jennifer Childs-Roshak, chief executive of Planned Parenthood League of Massachusetts, in a statement. According to most recent figures provided by the National Family Planning and Reproductive Health Association, Massachusetts received $6.15 million in federal Title X funds and served about 75,000 patients in the 2017 fiscal year. Religious conservatives have applauded the administration's action as a way to break down what they call an indirect taxpayer subsidy of abortion providers.